Chocolate and Easter go hand in hand… Along with jelly beans, peeps, chocolate eggs and other candy, right? Well what if it doesn’t have to be that way! What if there was a better way! What if we got back to what Easter is all about? What if we truly meditated on Christ, his resurrection, and what that means for us and our future? What if we taught our kids about the gift he has given us through his death on the Cross? Easter would just mean a little bit more. It would mean more than the Easter bunny, more than the candy! Easter is a celebration. 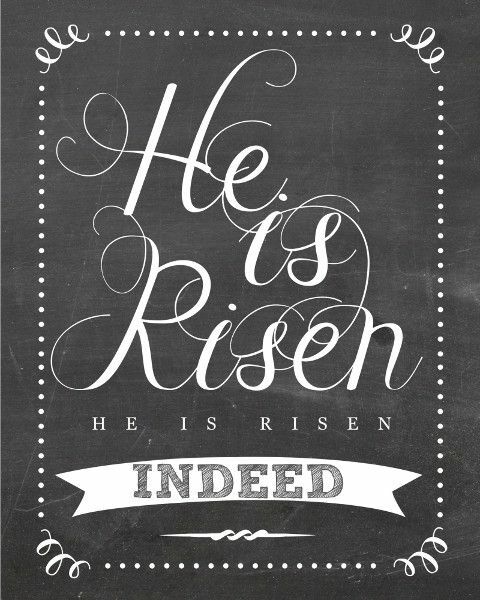 It is a celebration of the life to come, of new life that is given freely when we receive Christ, the one who died and rose again, as our Lord and Savior! It is about forgiveness and moving forward, it is about the FREEDOM that comes from having a relationship with one who died to give us life! Easter is about Jesus. Easter eggs are a great representation of new life, new life in Him! I have to admit, my life wasn’t always peaches and roses. It took me 22 years, before I realized that I didn’t want to live my life alone anymore, that I had enough struggles without Him! Never have I looked back, never have I wished I made a different decision. Christ in my life has been freedom and peace. He has guided me to make tough decisions and shown me great miracles. 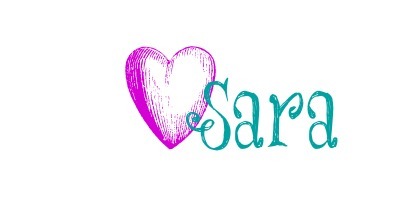 I’m still not perfect, nor is my life, but I am thankful, SO thankful for my new life in Him. With tears in my eyes I am thankful for who I am in Him. He has saved me. Nonetheless, Easter is still a time for fun! It is a celebration and we will have easter baskets! 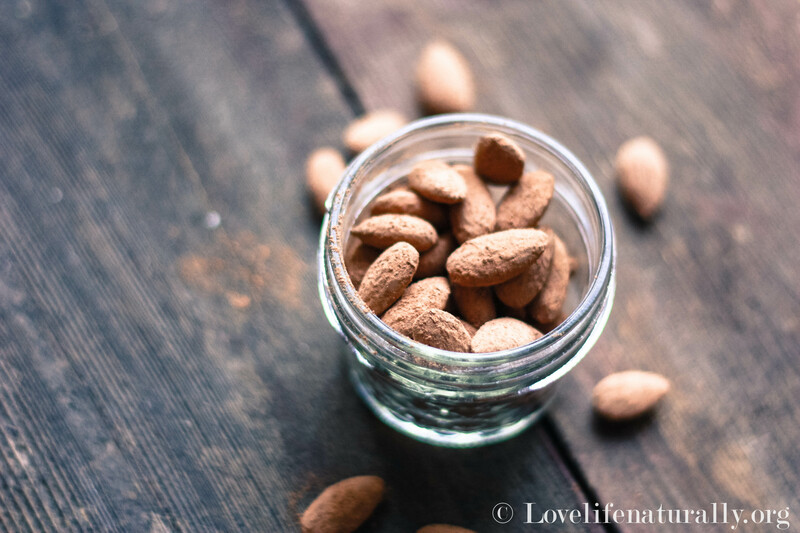 These Cacao and cinnamon dusted almonds are a perfect treat to have in a bowl for company or a little bag for the easter baskets! My family loves them! Almonds are protein packed ( 1/4 cup of almonds have as much protein as one whole egg! ), Cacao is a superfood (not to be confused with Cocoa), and cinnamon is great for blood sugar. 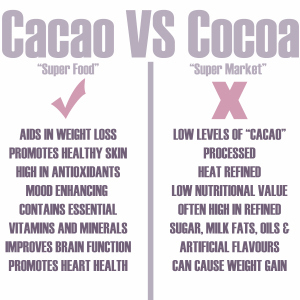 Even though Cacao is not super sweet, they definitely help curb my chocolate cravings! These are super tasty, so I hope you all enjoy! Deliciously satisfying and perfect for little homemade gifts or an afternoon snack! Measure out Almonds and spread out on a preheated baking sheet. Bake for 10 min. While the almonds bake, measure out the cacao, cinnamon and salt and place into a medium-large Zip-lock bag. Shake up to combine the ingredients well. Remove almonds from the oven and set aside. In a small saucepan over low heat, combine the Honey and vanilla. 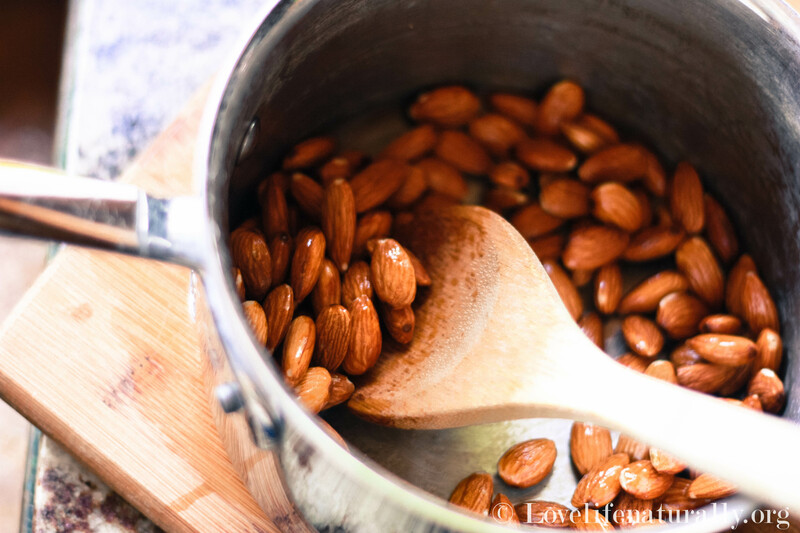 Once melted, toss the almonds until they are well coasted. 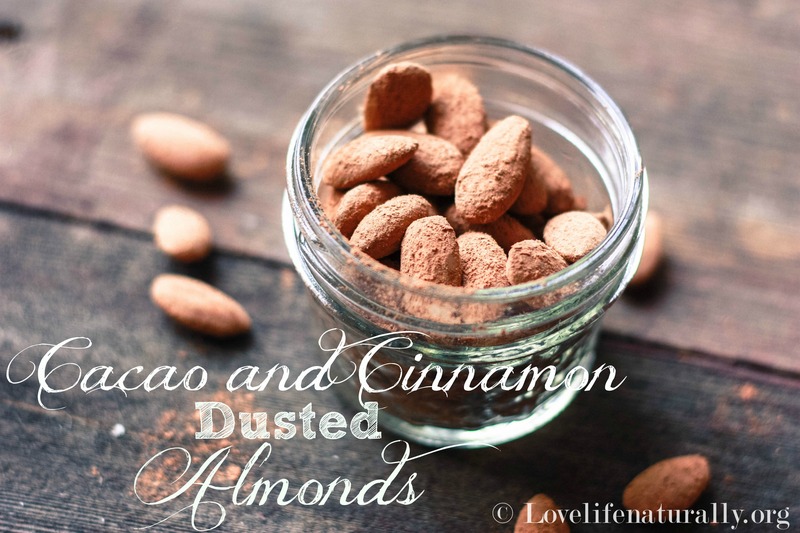 Add the almonds to the bag of cacao and shake! Preheat oven to 375 degrees. Measure out Almonds and spread out on a preheated baking sheet. Bake for 10 min. While the almonds bake, measure out the cacao, cinnamon and salt and place into a medium-large Zip-lock bag. Shake up to combine the ingredients well. In a small saucepan over low heat, combine the Honey and vanilla. 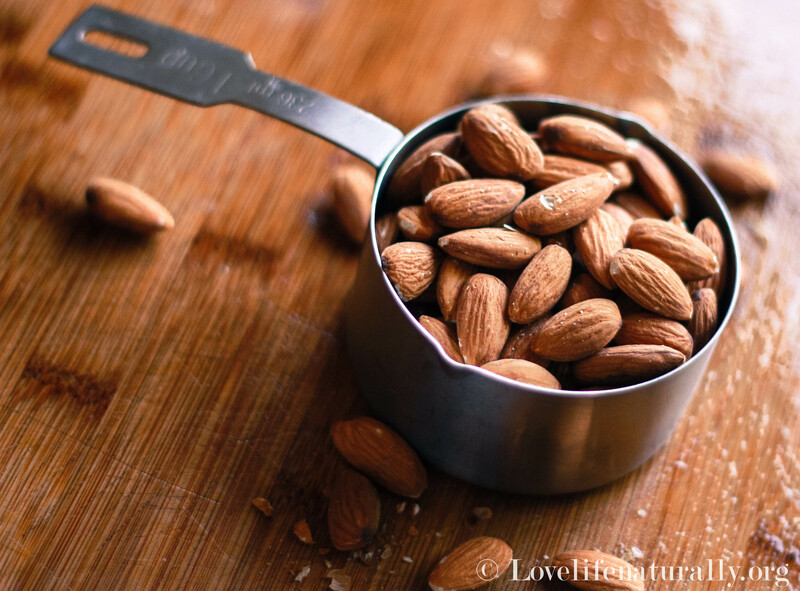 Once melted, toss the almonds until they are well coasted. Add to the bag of Cacao and shake! This little mason jars make the perfect portion to store for snacks, or add them to little bags for Easter! What are some other Healthy Easter Treats? Good news! They don’t have to all revolve around food! Easter treats can be FUN! And if you do want to include some sweet treats… make them Organic! Keep it clean, keep it healthy! 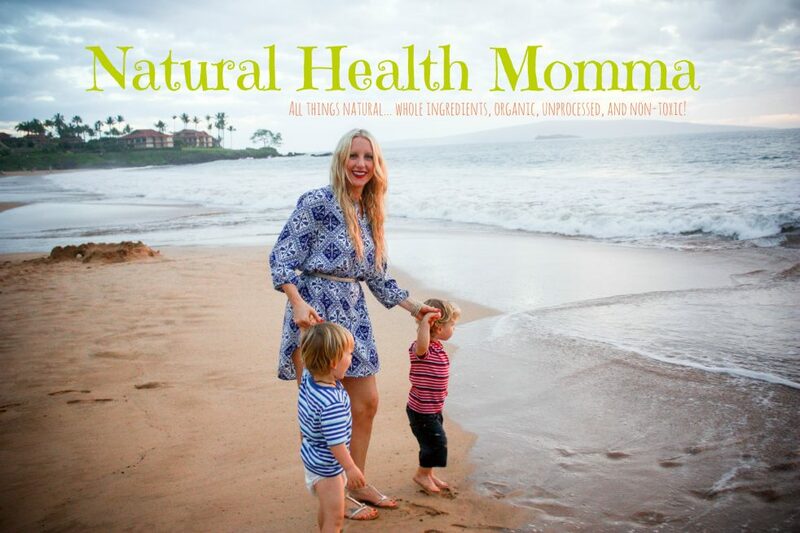 From my Natural Health Blog to you! Previous Post Green Smoothie Popsicles… For Your Picky Eaters! I love the idea for this dessert. 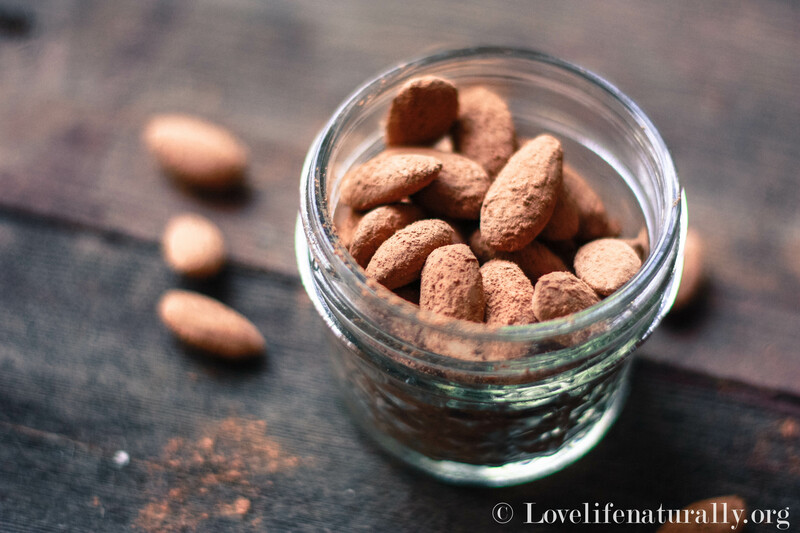 Do you know if you can buy cacao on organic food stores online?